Great news boys and girls. German rock giants Bonfire will be appearing at Nottingham Rock City on Sunday 30th June for their only UK show of 2013. 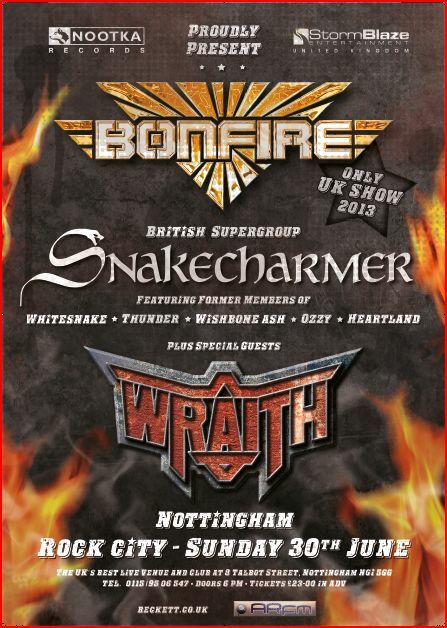 Alongside Bonfire, British supergroup Snakecharmer and Nottingham legends Wraith will be performing on the night. Snakecharmer is comprised of original Whitesnake members Micky Moody on guitar and Neil Murray on bass, along with Wishbone Ash guitarist Laurie Wisefield, Thunder and Magnum drummer Harry James, Ozzy Osbourne’s keyboardist Adam Wakeman, and Heartland’s Chris Ousey on vocals. Snakecharmer will be playing classic rock songs that they themselves helped to create and make famous, such as Whitesnake’s Here I Go Again, Fool For Your Loving, Don’t Break My Heart Again, Ready An’ Willing and Ain’t No Love In The Heart Of The City, as well as other hits from the band members’ back catalogue. The list of world-class bands and musicians that the members of Snakecharmer have collectively played with runs into literally hundreds: Eric Clapton, Tina Turner, Joe Cocker, Jeff Beck, Gary Moore, Magnum, Queen & Paul Rodgers. Hailed as “the new hope” for the British Hard rock scene, Nottingham’s own legends Wraith had an illustrious and successful career playing capacity crowds worldwide and even having Motorhead’s Lemmy Kilmister singing backing vocals on the debut album “Danger Calling”, which was also produced by Guy Bidmead (Whitesnake/Motorhead), mixed by Pete Way (UFO) and Brian Robertson (Thin Lizzy). Wraith’s next album, “Riot” (which was produced by Mark Bruce (Black Sabbath/Magnum)) and their third album “Schizophrenia” saw Wraith’s popularity spread worldwide and saw them playing to capacity crowds and touring with artists such as UFO, LEGS DIAMOND, WOLFSBANE, MAMAS BOYS, GRIM REAPER, WRATHCHILD, MARSHALL LAW, SAXON, and MOTORHEAD.